Wearing a crown isn't as easy as it looks — just ask Britain's Queen Elizabeth II. In a rare interview for the documentary "The Coronation" on the Smithsonian Channel, Her Majesty discussed the "disadvantages" of wearing one. The 91-year-old monarch noted the Imperial State Crown, which she wore during her coronation ceremony on June 2, 1953, is so heavy "your neck would break off." "Fortunately, my father and I have about the same sort of shaped head, but once you put it on, it stays. I mean, it just remains itself," Her Majesty said of the diamond-encrusted crown that King George VI also wore during his coronation on May 12, 1937. "You can't look down to read the speech, you have to take the speech up. Because if you did your neck would break, it would fall off." She then added, "So, there are some disadvantages to crowns, but otherwise, they're quite important things." The Queen also revealed how "horrible" it was to ride to the ceremony at Westminster Abbey in the four-ton gold coach. "It's not meant for traveling in at all. I mean it's only sprung on leather. Not very comfortable. It can only go at walking pace. The horses couldn't possibly go any faster. It's so heavy," the Queen said. Still, the monarch rode in the Gold State Carriage for nearly five miles that day. This is the first interview the Queen has given throughout her six-decade reign. In fact, she's the only member of the royal family who has never sat down for a formal interview. 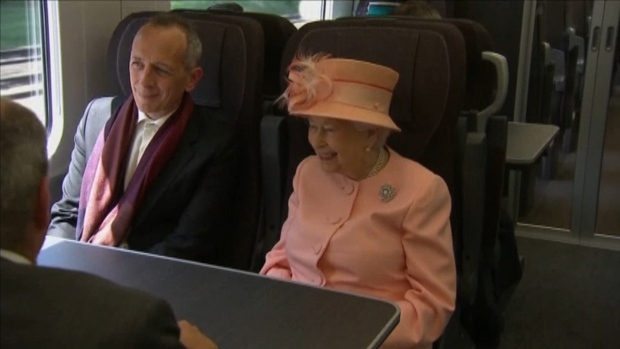 Queen Elizabeth and her husband, the Duke of Edinburgh, marked the 175th anniversary of the first train journey by a British monarch with a train trip from Slough to London’s Paddington Station. "The Coronation" will air in the U.S. on Jan. 14 at 8 p.m. ET on the Smithsonian Channel. It was made in partnership with the BBC and Australian Broadcasting Corporation and is part of the Royal Collection Season, a collaboration between the BBC and Royal Collection Trust.